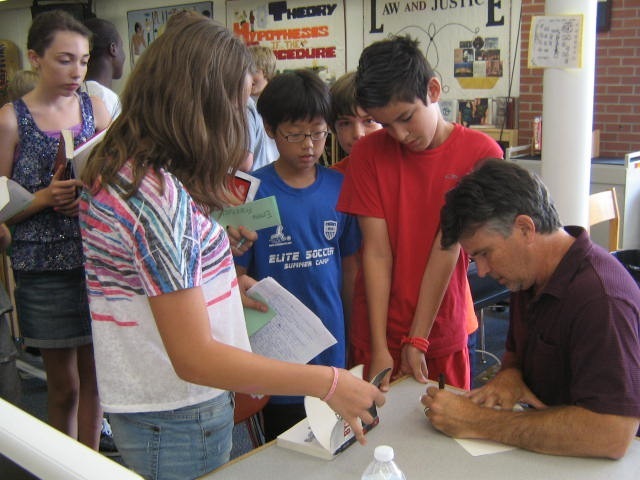 I had a great visit to Thomas Middle School, north of Chicago, a couple of weeks back. First-class all the way, the administration, teachers, students, everybody. They even sent me a bunch of photos from the visit. Here’s a few . . . 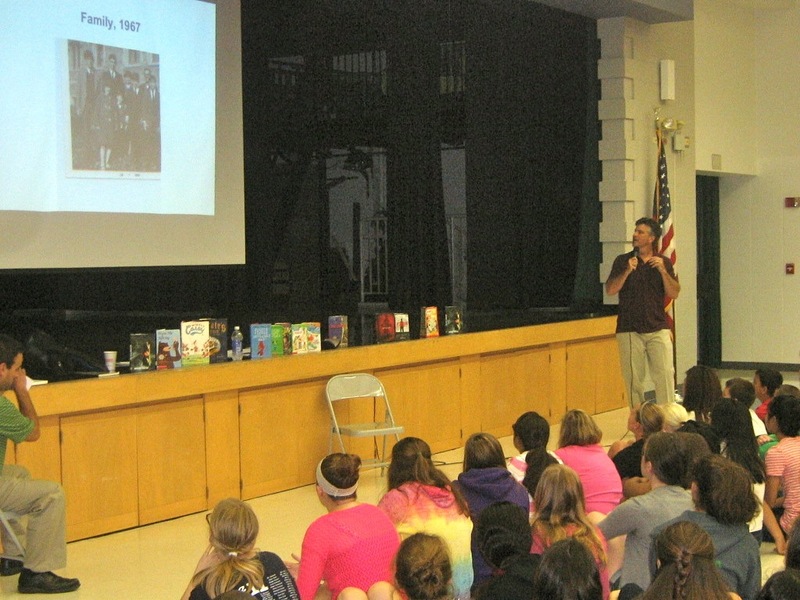 The day began with two large presentations, 450 students each, grades 6-8. 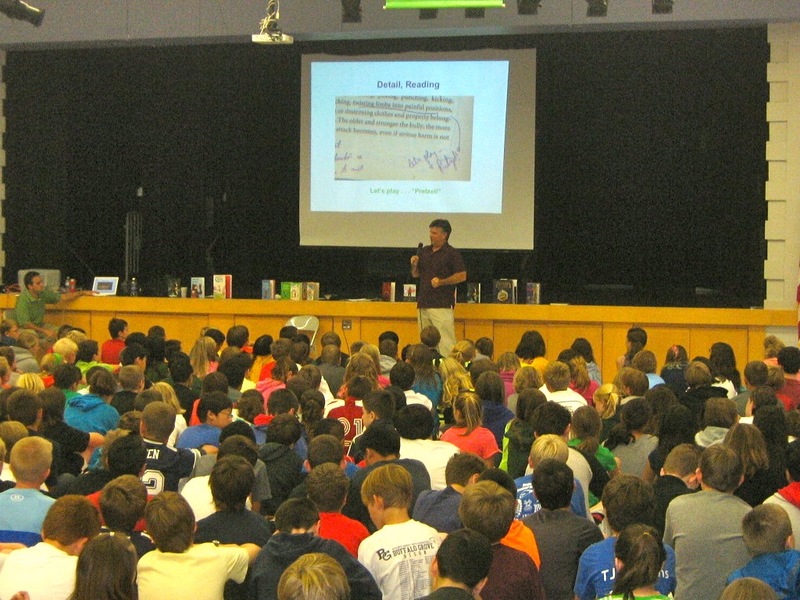 All 900 students had read my book, Bystander, over the summer. I also had the opportunity to meet with two small groups for Writer’s Workshops. I enjoy when I get the opportunity for this kind of thing, because it’s less about me, more about writing, and more about the kids. Small and intimate. I love that moment when we get to hear what they’ve written — when what’s inside is brought out into the light. The boy in this particular photo laughed to himself the entire time he wrote. Giggling, scribbling, snorting, writing. He was not a “serious” writer in the tradition of Samuel Johnson. When it came time for volunteers to read aloud, he could barely get through his piece without cracking up. Were there farts in his story? I think there may have been, yes. Possibly some projectile vomiting, it’s hard to recall. But I loved that he was laughing, enjoying himself. It was fun. As a writer, the worst thing you can do is be boring to yourself, because if that’s the case, you’ll surely bore everybody else, too. This boy made us all laugh because he began first by making himself laugh. I also got to sign books. How to do you spell that again? Is that Sarah with an “h”? Oh, really? Three r’s? Okay! A great school, and a great day. Thanks again, Marc Goldstein, for making it happen. I’m grateful. Thank you for your wonderful presentation at our school. We read Bystander as a class and really enjoyed it. Our class made drawings of each chapter. Some of us felt sad at the end of the book because we wanted to know more about your characters. Some of us felt happy at the end of the story because we felt accomplished. Thanks again for coming to visit Thomas Middle School. Thanks for the kind note. I wish I could see those illustrations! I had a great trip to your terrific school, thanks for having me.